I have been experimenting with Amazon’s Elastic File System (EFS) service on a real web app running across multiple instances. With some effort, I have a file upload and sharing app serving from three web servers sharing a single EFS volume. But due to the performance characteristics of EFS, it wasn’t easy to get going. All this leads me to conclude that EFS works ok. I am actually happy with the app deployment after getting it all set up. However the relatively slow performance could require code changes and an putting a CDN in front of many types of web apps. Let’s dig into running a horizontally scaled web app on EFS. EFS is an implementation of the Network File System (NFS) protocol. 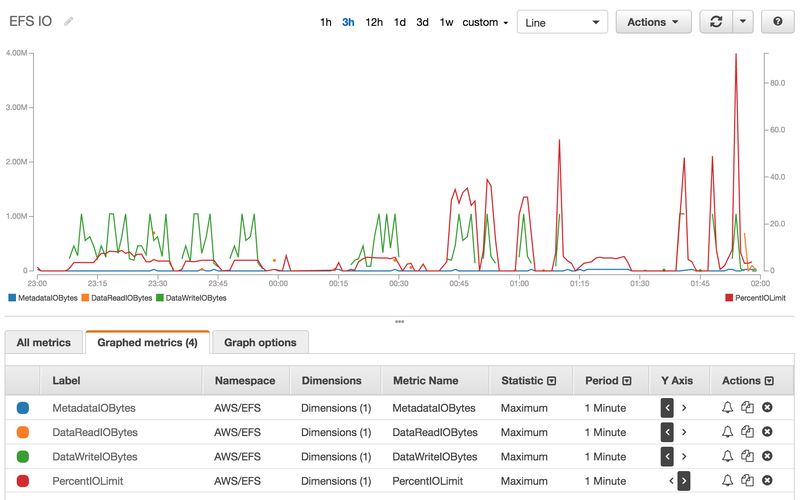 On AWS, every instance uses an NFS client to connect to the EFS endpoint, and synchronizes file metadata and data over the network. Because NFS looks like a standard filesystem, it integrates with virtually any system. For example, it is trivial to use an EFS volume with ECS and Docker containers. Amazon offers a lengthy doc about EFS performance and NFS filesystem tuning. Baseline throughput, burst throughput and credits are complicated but well documented. I have been doing my AWS testing with Convox, an open-source PaaS built on top of AWS services. Following a “use services, not software” philosophy, Convox uses EFS for persistent container volumes. With the Convox tools it only takes a few minutes to set up a production-ready three node ECS cluster with EFS and deploy an app to it. The app I am testing is ownCloud. This is an open-source PHP program that’s primary purpose is to store and serve lots of file uploads. It is distributed as a Docker image that uses Docker volumes serve the app and save and retrieve file uploads. I am using EFS in “General Purpose Performance Mode”, the recommended setting for web server environments. I am also using the recommended Linux mount options. The logs indicate the main container is not passing a health check in 30 seconds so it is constantly terminated and restarted. What gives? 8 minutes to untar onto the EFS volume?! Yikes. The ownCloud image is trying to copy 11,000 files that take up 98 MB to the EFS volume. I saw between 204 kBps for the sequential untar and 1.63 MBbs for a parallel rsync. The CloudWatch metrics for EFS are very good. I can see over the course of the experiment that initial I/O percentage (red line) wasn’t coming anywhere near 100%. With lots of parallelism I could eventually max out IO which brought copy time down significantly. The manual tests had a big positive side-effect. Since EFS is persistent, the ownCloud version.php file now exists on the volume, so the entrypoint no longer needs to do the untar. The app boots! 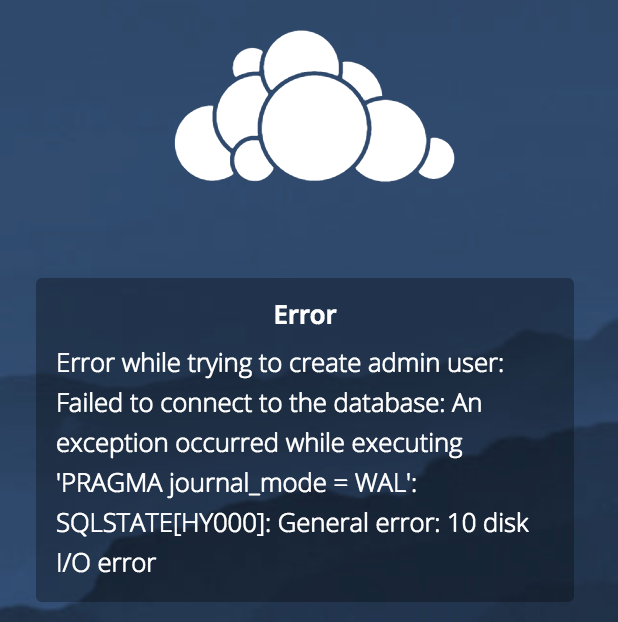 ownCloud defaults to SQLite. It shows a big performance warning around SQLite on any filesystem. But does it work on EFS? I get an I/O error creating the database. Looking at the volume the database file is 0 bytes. It seems like the write latency is a challenge for the PHP code and SQLite database driver. Of course I would heed the SQLite warning in all cases and use RDS. Configuring that and I finally have ownCloud running! Finally I wanted to look at how the application performs. First I uploaded 20 photos knowing these will be saved to EFS. I didn’t perceive any slowness outside of normal file upload time. Then I shared this folder publicly, which gave me a URL to a page with the 20 photos, thumbnails and metadata. One second for every response isn’t great but isn’t horrible either. And the response times are very consistent. Finally, I’m ready to test the true promise of EFS. I can scale out my web containers since they all share the same EFS volume. Every container is running on its own instance. All the requests returned, but performance decreased. Some requests took 12 seconds to return. The variance must be due to the containers coming up on instances that are “cold” and accessing the data the first time. After a few more runs of Apache Bench over the next minutes the performance evened out. Even after all this, I feel pretty good about running a web app off EFS. I now have web app served from a shared EFS data volume. The app feels fine for normal file uploads and downloads. Response times can be slower and more variable that I’d like, but once the app is “warmed up” it benchmarks well. This web is highly available, horizontally scalable and required no code changes. The data is also highly available with no operational work. The visibility through CloudWatch is very good showing I’m not anywhere close to maxing out EFS I/O. For this particular type of app, the final step would be to add a CDN to improve performance and have the best of all worlds. That said, the performance characteristics of EFS are concerning. Just like SQLite not working and tar going slow, I can see many standard apps having trouble with the latency or throughput. This could be a deal breaker for many apps. When EFS was announced, many people immediately dismissed it saying that NFS has no place near production. Is this still the case? How do we do better for sharing data across instances and containers? Do we need to operate our own NFS server or distributed file system to take control over performance? Maybe the lack of raw performance is acceptable for the consistency and reliability of the EFS service? Or do we stick to stateless apps at the Twelve Factor App wisely suggests? Tweet at @goconvox or chat with us in Slack to discuss.